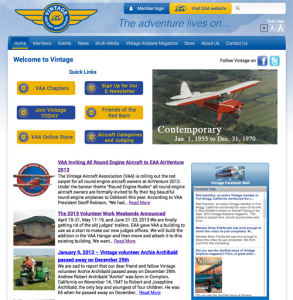 A major addition to the VAA web presence is a Member’s Only section where VAA members can communicate with each other about their restoration projects, volunteer work for the association, and share hangar talk. 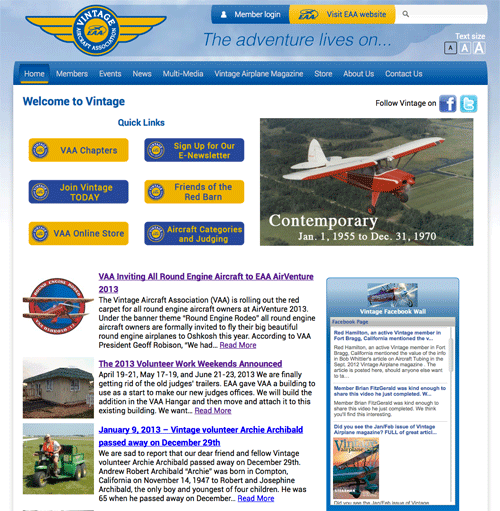 Members can also view past issues of Vintage Airplane at their leisure. We have tried to redesign the site for easier navigation and better viewing throughout. For those of us with failing eyesight, notice the three white A A A on the bottom right of the site header. Clicking on these icons will magnify the content text for easier reading. When you explore pages beyond the main menu, a gold navigation bar displays at the top to show you where you are and how to get back where you were. Photos on all pages are clickable. They will either take you to the referenced page or expand for easier viewing. We have expanded from a dozen photos in our gallery to multiple galleries with hundreds of photos. If you have vintage photos to share, please send them to us. PDF documents will open in a book-style reader. You can click on the top left icon to expand the book to full screen. There is an email form on the Contact Us page. Please send us you comments and suggestions.